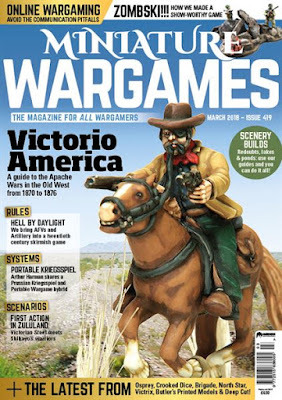 What’s in effective range in (mostly) historical wargaming with reports on Battlefront, Victrix, Butler’s 3D, North Star, Deep Cut and Stoessi. Helpful hints to help with running a long-distance campaign over the web. Part two of a set of rules for 20th Century Skirmish: AFVs and artillery! A scenario for use with either Victorian Steel or Black Powder. A Napoleonic conversion of Bob Cordery’s Portable Wargame system. A French Indian wars poser by Jon Sutherland. The creation – and the rules – to fight a modern Zombie game. The usual sensor sweep of the latest news in F&SF gaming with releases from Darkest Star; Osprey; Titan; Daemonscape; Crooked Dice; and Brigade. Part one of a guide to the Apache Wars in the Old West from 1870 to 1876.